This is a beautiful book. One hardly knows where to begin to describe it. More than a "coffee table book," it holds its own with any of the best art/literature genre out there. The illustratuions are lush, the poetry sings. Enjoy! Christine Renhard Stenstrom is one of those rare and gifted artists who is able to cross boundaries in a delightful blend of lyrical prose and graceful artwork. She guides the reader on a well paced, diverse and eclectic journey, with intimate glimpses into her own persona. The richness of each painting and piece of prose radiates from the glossy pages, reminding us to see beauty in our daily surroundings. 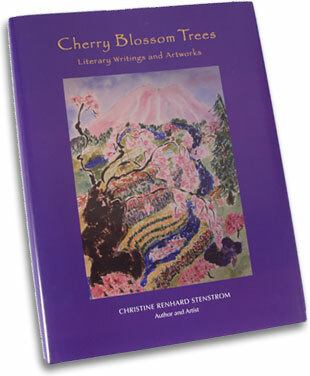 Cherry Blossom Trees... is simply put, a book of excellence, teeming with character and color. Christine Renhard Stenstrom’s work as a painter and writer vividly reminds us that just as painting can speak, writing can picture, help us to see, to enjoy, and to determine for ourselves beauties seen and unseen all around us. The intersections of different art forms themselves are points at which understanding and feeling intensify and achieve clarity. Christine Renhard Stenstrom has given us a new gestalt through which art and prose illuminate each other in vivid colors and memorable text. This work elicits visceral, aesthetic, and spiritual responses to the depictions and descriptions that are framed by this remarkable work. Cherry Blossom Trees…is a beautiful container for beautiful work. Christine Renhard Stenstrom’s artwork is so full of life and a sense of place. It feels as though it moves on the page. Her writing is filled with sensory descriptions and lovely details. Clearly, she is a writer and artist who appreciates and is a little in awe of the beauty and wonder of the physical world. When I traverse with Christine in “Chief Sealth From Above” to “Senorita, Dos Boletos, Por Favor?” then “Lost Blossoms of Promise” to the “Flight From Kosovo” onward to “Blue Heavens of 9/11” and further “Bourbon Street and Black and White Diamonds”, my journey witnesses contemporary political renderings displayed in brilliant color accompanied by authentic message. While her pastel and watercolor impressions of these events are gloriously taciturn, she boldly gives empathetic testimony to our planet’s condition. Every sojourner of “Cherry Blossom Trees” will delight in creatively participating with Christine as she ceremoniously takes us with her through life’s encounters. This artist’s solicitous collection will induce humble appreciation for life in the 21st century.